Today we are happy to announce that 3 employees have received the Shining Star award. This award is given to employees who go above and beyond their daily job responsibilities. The most recent award went to Tina Buch, the Registration Specialist/Secretary in the Bridgeville office. You can find Tina greeting consumers at the front desk, calling to remind consumers of their appointments with the BSC’s, organizing the shelves of Mary’s Market and always being on the lookout for those who need a bag of food from Mary’s Market. These are all part of her daily routine. Tina is being recognized for what her nominator witnessed one recent snowy Friday morning. The nomination read, “When we arrived at the office today at 8:15, on our third day of the Polar Vortex, it was pretty snowy and wet outside and it is a Friday. There is not maintenance staff here yet and when I walked through the building to check the front steps, before I went upstairs, I heard someone shoveling. I came to discover that Tina was shoveling the front steps and walkway and salting the area. I was very impressed and pleasantly surprised that another staff member thought of clearing the entrance. In addition, I found out later that Tina was also covering the front desk that morning for another staff person who could not make it in early due to the weather conditions. “ Congratulations and thank you Tina for going above and beyond! Next, we were happy to recognize Sara Dickson, LTSR RN Supervisor with the Shining Star award. Sara is being awarded the Shining Star because of her kindness and thoughtfulness showed to her fellow employee at the LTSR. Her nominator shared the following in their nomination, “I wanted to nominate Sara Dickson as our Shining Star. It is obvious to me that Sara exemplifies the empathy trait that we want all of our Chartiers employees to embody. Her empathy not only extends to the residents of the LTSR but also to its employees. After a recent employee accident Sara worked with the residents of the LTSR to make cards and pictures for this employee and she personally delivered those items to this employee in the hospital, on her own time. According to her co-worker, it really brightened her day to see Sara. 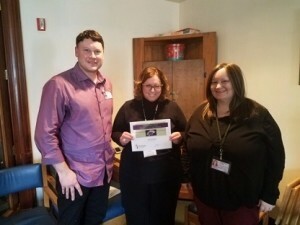 We want all of our staff to have empathy for our clients, but to also show empathy to our co-workers goes over and above our mission at Chartiers.” Congrats Sara! You exemplify the spirit of the Shining Star award. While it has taken some time to award this employee for their actions we were happy to recognize Isaiah Griffin, Maintenance staff with the Shining Star award. During the month of July, the 2nd floor of the main office building in Bridgeville was under construction. The nominator offered the following, “Mark Corso was off on previously scheduled PTO on two separate occasions in the month. Due to the timing of the construction and program deadlines, Isaiah was the only maintenance staff on duty when we had to complete several office moves. During these times, Isaiah had to move all of the heavy and awkward furniture by himself. This included taking apart desks to remove them from offices and reassembling them in the new space. He also had to remove and dispose of other heavy objects such as cinderblocks. 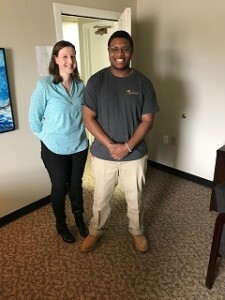 Additionally, Isaiah offered to work extra hours (canceling some of his personal plans) to make sure that these moves were completed in accordance with previously mentioned deadlines, all the while with a smile on his face!” Isiah, we appreciate your extra effort! 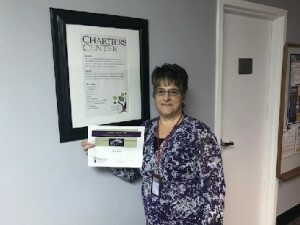 If you work with a Chartiers Center employee who you think has gone above and beyond their job duties please nominate them for the Shining Star award. It’s easy. Send an email to Mary Kay Bonn and tell her who you are nominating and why. Winners of the Shining Star receive a $50 gift card in recognition of their service to consumers and/or other staff and the agency.